10-11 in. TWO FLOWERS ftd. bowls in white and marigold. Has three curled feet. Aqua TWO FLOWERS Sauce - Three toes. Collar Base TWO FLOWERS 9 in. Plate - $1000 - 1-8-05. TWO FLOWERS in Vaseline.9 in. Bowl. TWO FLOWERS: Whether you like 10”-11” ball footed ruffled bowls in amberina, amethyst, black amethyst, aqua/teal, blue, powder blue, green, lime green, marigold, red (only 2 known), sapphire, vaseline or white, or ice cream shape/round in that large size, known in aqua, blue powder blue, green lime green, marigold, sapphire, smoke, vaseline or white, there is a wide selection to choose from. Blue and marigold rose bowls made from the ball footed versions exist. Marigold chop plates with ball feet are scarce, but they do exist. 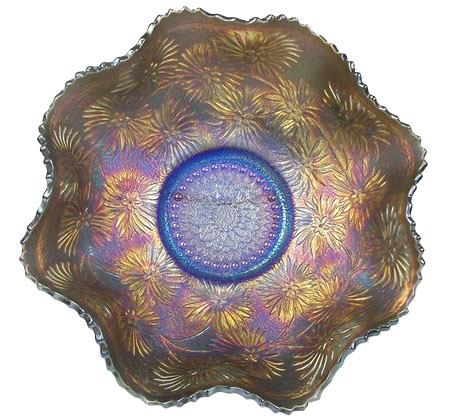 8”-9” spatula footed bowls in amberina, amethyst, blue, green, lavender, vaseline, marigold, red and white, as well as 9” spatula footed plates in marigold might satisfy your “fancy”. There are some 8”-9” collar-base bowls in marigold, as well; along with a few collar base plates in that size. 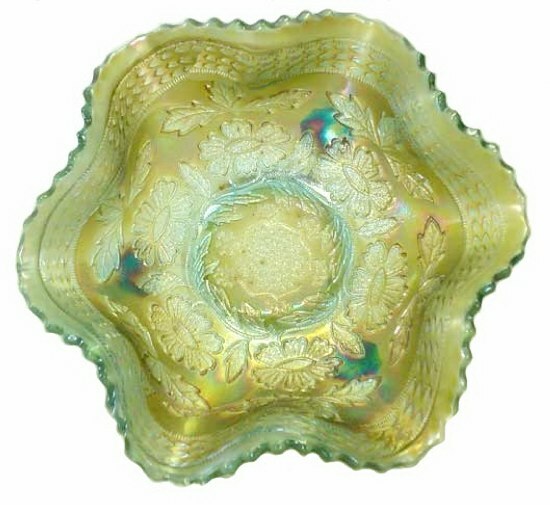 Then there are small spatula footed rose bowls in amethyst, blue, marigold and white, as well as a nut bowl shape in blue, green and marigold. 5”-6” sauces are available in amethyst, aqua, powder blue, green, lime green, sapphire, vaseline, marigold and pink. Can you imagine how long it would take to create a collection of one each in all the offerings named? Two Flowers in all of its many formats must have been a huge seller during the manufacturing years! 9 inch Blue TWO FLOWERS Bowl Whimsey. TWO FLOWERS whimsey: This piece completed its run on eBay 8/24/11 following more than 40 bids, for a total of $3,350. SO>>>>>>where has this “bitty-bit” been these many years? It began its existence as the 8 ½”-9” footed bowl. That is, it left the Fenton factory in that mode. 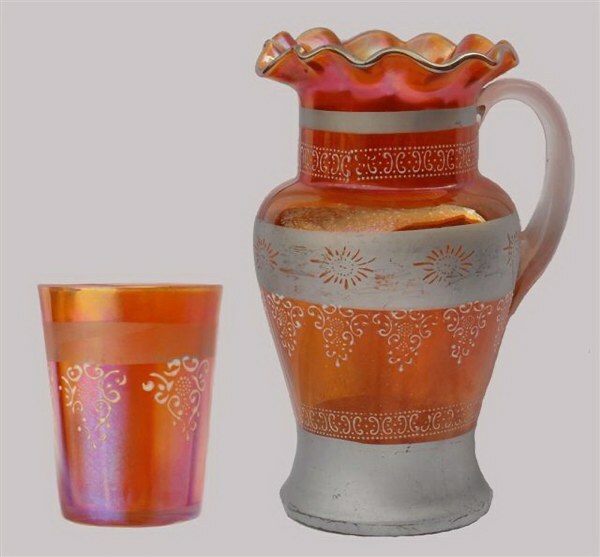 With exposure to such oddities as the distorted tumblers, etc., turned into “cuspidors”, displaying burned and wrinkled glass results from overheating in order to alter shape, THIS one offers a new, more precise method of altering the original shape. 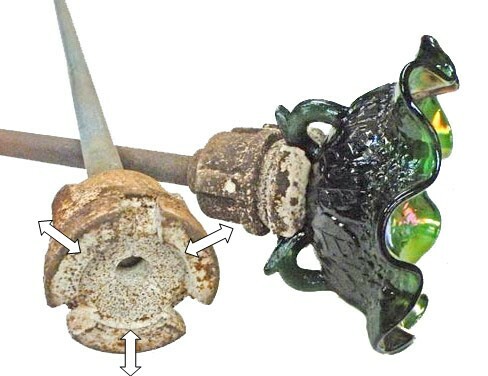 Place the original (factory-made) shape into a small furnace-(the type found in garage operations)—as small as 2 ft. sq., bring the temperature up slowly to 2100 degrees, so that the glass is pliable. Remove from the furnace and place it into a hot snap. Shape the piece. Place back into the furnace. Drop the temperature to 1500 degrees. Continue to drop that temperature for a period of 8 hrs., till it is down to room temperature. Now the piece is “tempered” and ready to sell for “big bucks” to those who do not realize how “deviations” are borne! (This method does not “burn” the iridescence, as we note in other such distortions.) Clever—you say! As with any “developmental approach”, time-trial-testing produce cleverly deceptive results! Isn’t this the money-making approach to most “gadgets” of today? The three holes cast into the snap to receive the three-toed pc. having no collar base. The snap grips all three legs. SNAP with three cast holes: When the snap is closed over a three-toed piece without a collar base, the pressure is applied to the top of the toes, holding it into the snap. SILVER BAND #1- Courtesy Gerald Welsh and Candy Brockmeyer. SILVER BAND #1 Water Set: Although this set is credited to Fenton manufacture, we can find no trace of it in the literature we have surrounding their production. For that matter, no material on the Silver Queen set can be found either, and that has always been considered a Fenton product as well. 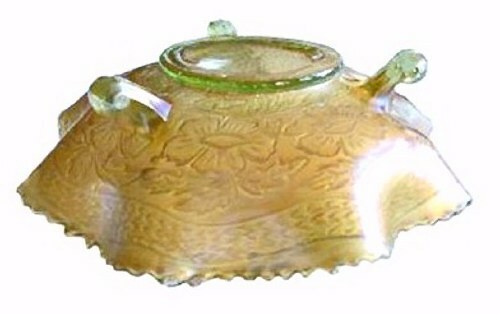 Likely a Depression era design, it is not discussed in the Second Twenty-Five Years of Fenton Glass account either. SILVER QUEEN #2 - Courtesy Gerald Welsh & Candy Brockmeyer. SILVER QUEEN #2 Water Set: Gerald and Candy certainly have a knack for “finding” quite rare items! This pitcher shape differs from the bulbous example we discuss in Fenton Water Sets/Tumblers – Part 1. 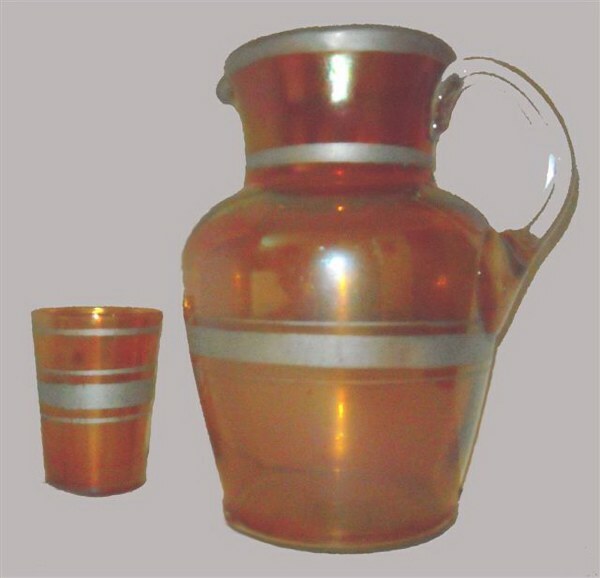 The same tumblers accompany each of the pitcher shapes. 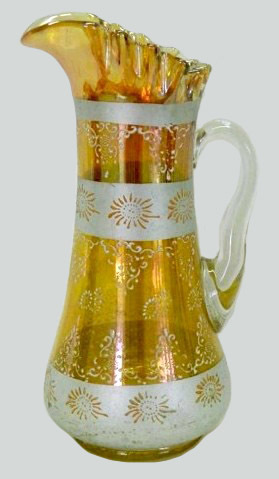 SILVER QUEEN Tankard: This version of the pattern appeared in an early 2013 Seeck Auction. This tankard shape is not discussed in previous written records at our disposal. LITTLE DAISIES - blue - sold for $1250. in 2-2010. I will come again and receive you to Myself; that where I am, there you may be also.